The waistcoat is popular attire in a gentleman’s wardrobe because of its versatility and simplicity. Waistcoats are a statement piece. It has great impact and is difficult to ignore or overlook. It is very easy to style and coordinate with different pieces to create different looks. 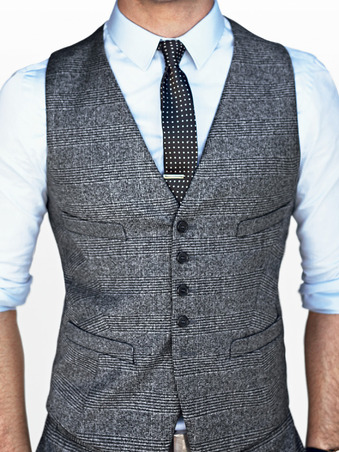 Today we bring to you 7 different and charming waistcoat looks to try out this season. 1. Look 1: As a part of a three piece suit. This looks suave and debonair. You can either go for a double breasted waistcoat or a single breasted one in contrasting hues. You can pick a windowpane waistcoat or go for some other pattern. You can experiment with silk or tweed. You can even wear the WC with a tux. Accessorize with a stylish and elegant pocket watch and/or a lapel pin. 2. Look 2: Team up a waistcoat with a shirt and a denim jacket. You can wear trousers or make it a denim look with a pair of jeans. The shirt too can be a denim shirt. Do not wear a tie. If you are going for a denim on denim look then make sure the denim piece are in different shades. 3. Look 3: Team up a waistcoat with a solid oxford button down shirt and a leather jacket. Pair it up with some faded or distressed jeans and boots. This is a very fresh and casual look. I think what’s missing now is just a cool bike. 4. Look 4: This is a very preppy, fall/winter look. Pair a shirt with a waistcoat and a cardigan. You can either wear a neck tie or sport a bow tie. A cool tip would be to either keep the bow tie and cardigan solid and waistcoat patterned or keep the waistcoat solid and coordinate the patterns in the cardigan and bow tie. You can wear jeans, chinos or trousers with some boots. 5. Look 5: Pair a button down shirt, either solid or patterned, with a waistcoat. Roll up the sleeves. Add a neck tie or a bow tie. Complete this look with a pair of dark denims. Cuff the bottom of your jeans. Add a lapel pin, an iconic metal one like a moustache or glasses. Accessorize with a cool watch. 6. Look 6: Pair a combination of shirt and trousers with a single breasted waistcoat. Leave the top one or two buttons of the shirt undone. Add a pocket square. Complete the look with boat shoes or loafers and a hat. 7. Look 7: This is a very Victorian / Newsboy look. Wear a button down plain white shirt below a satin waistcoat. Roll up the sleeves. Go for a pair of trousers or jeans in shades complimentary. Add a bow tie. Wear suspenders over waistcoats, secured to your pants. Complete the look with oxford shoes.